If you are looking to complete your vampire look and you want something with more appeal than standard fangs, why not try out the Vampire Blood and Fangs kit? 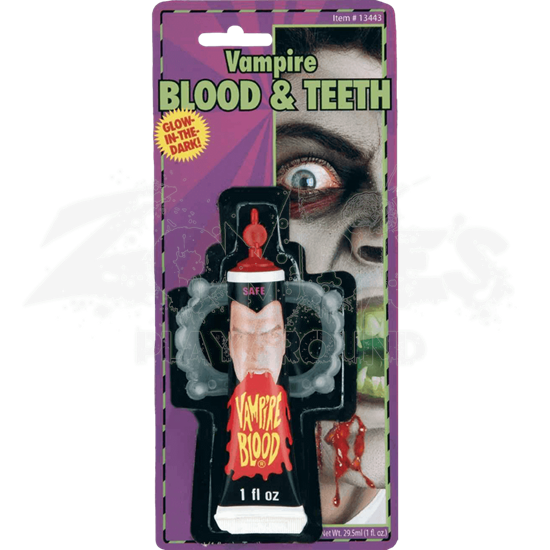 Included in each kit is a tube of vampire blood and a set of vampire fangs. These fangs are not your average vampire fangs, though, as these will give your teeth a real gleam when you show them off in the dark. These vampire fangs are little plastic insets that are designed to be worn over your teeth without any discomfort, while altering your teeth to look like you have long, sharp, vampiric fangs. They also happen to glow-in-the-dark, which gives your fangs a unique and distinctive gleam whenever you are in the darkest shadows. Included with the kit is 1 fluid ounce of vampire blood, which can be dabbed onto your skin and lips to make it look as though you have just finished with a blood donor. When you are looking to finish up a classic and complete vampire look, consider adding the Vampire Blood and Fangs kit to give your blood-sucking look a distinctive and unique flair that will certainly make you stand out from the typical nocturnal predators.